CBI - China: Day 29 of 41 of the 1st Battle of Shanghai. CBI - China: Day 56 of 142 of the 1st Battle of Hebei. CBI - China: Day 5 of 9 of the Battle of Rehe. Spain: Day 224 of 985 of the Spanish Civil War. Spain: Day 589 of 985 of the Spanish Civil War. CBI - China: Day 234 of 2,987 of the 2nd Sino-Japanese War. Day 19 of 124 of the Battle of Henan. Spain: Day 954 of 985 of the Spanish Civil War. CBI - China: Day 599 of 2,987 of the 2nd Sino-Japanese War. Finland: Day 88 of 105 of the Russo-Finnish War. CBI - China: Day 964 of 2,987 of the 2nd Sino-Japanese War. Day 103 of 381 of the Battle of South Guangxi. Day 29 of 67 of the Battle of Wuyuan. ETO - UK: Day 173 of 258 of the Blitz. MTO - Greece: British Commandos land on the Italian held island of Castelorizzo in the Greek Dodecanese Islands. MTO: The British submarine HMS UPHOLDER sinks the Italian cruiser ARMANDO DIAZ to the southwest of Malta. East Africa: Day 261 of 537 of Italy's East African campaign in the lands south of Egypt. British Nigerian troops of the 11th African Division occupy Mogadishu, the capital of Italian Somaliland. East Africa - Eritrea: Day 21 of 56 of the Battle of Keren. CBI - China: Day 1,330 of 2,987 of the 2nd Sino-Japanese War. Day 27 of 31 of the Battle of South Henan. CBI - Thailand: Day 148 of 221 of the Franco-Thai War (Vichy France vs Thailand). USA: The "Battle of Los Angeles" erupts as a barrage balloon, thought to be an attacking force from Japan, drifts over the skies of southern California. Over 1,800 anti-aircraft shells are fired in the early morning hours. The entire incident was declared a false alarm triggered by "war nerves," but 3 civilians are killed by friendly fire and another 3 deaths from heart attacks are attributed to the stress of the hour-long bombardment. 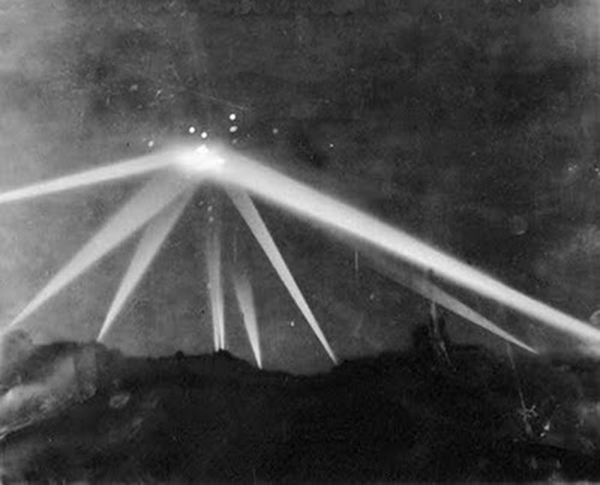 The "Battle of Los Angeles"
This photo of searchlights focusing over Los Angeles has led "ufologists" to conclude that it was a flying saucer. Keep in mind that the photo had been retouched before it was printed the next day in the Los Angeles Times. 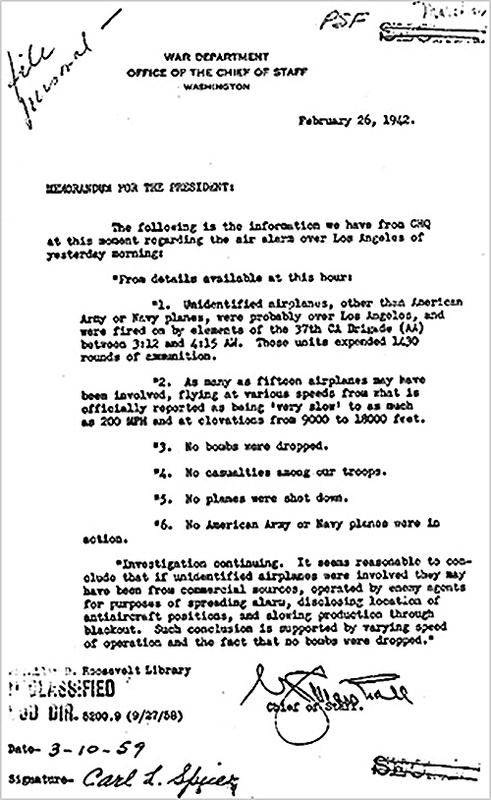 Army Chief of Staff General George Marshall's report of the attack to President Roosevelt. It states: "1430 rounds of ammunition were fired. As many as fifteen airplanes may have been involved. No bombs were dropped. No casualties among our troops. No planes were shot down. 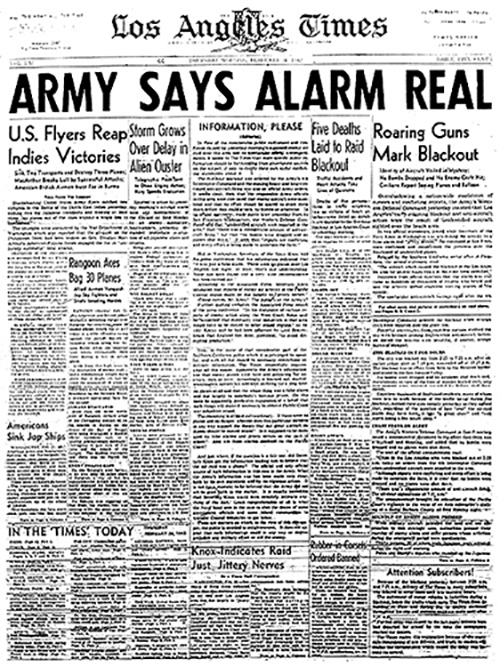 No American Army or Navy planes were in action. Investigation continuing." 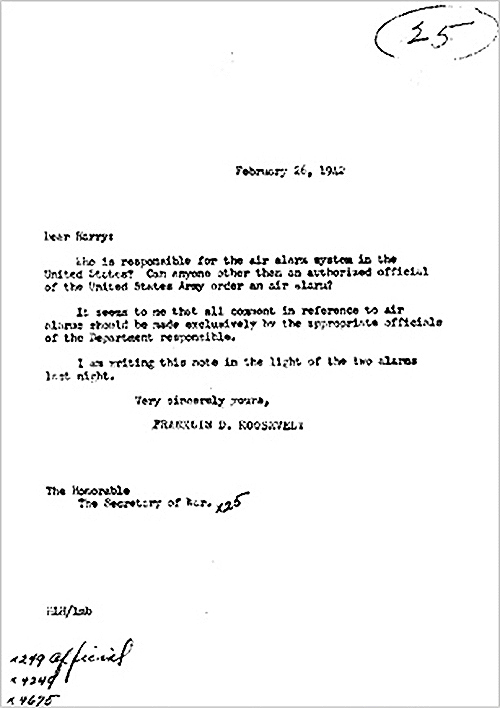 President Roosevelt's response to Secretary of War Henry Stimson raises concerns over who is responsible for the air alarm system. Page B of the 26 Feb 42 Los Angeles Times, showing the coverage of battle and its aftermath with many articles on people finding dud shells, unexploded ordnance, etc. 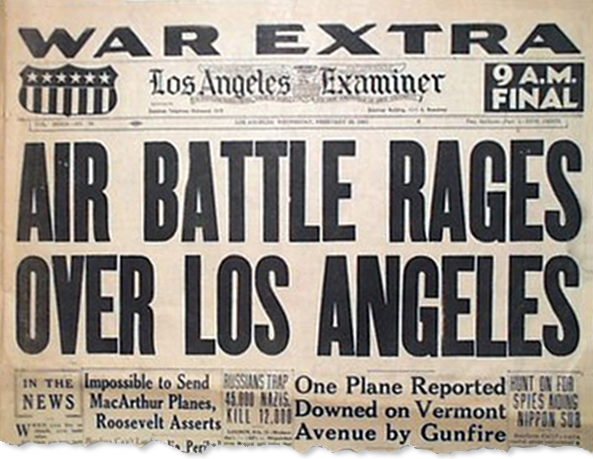 Front page of the Los Angeles Examiner helped spread many rumors, too. UK: The debate in the House of Commons ends with many speakers being sharply critical of government policy of bombing Germany being called in to question. Atlantic: Day 43 of 169 of Germany's Second "Happy Time," during which U-boats sink 609 Allied ships with little risk. Russian Front - North: Day 171 of 872 of the Siege of Leningrad. Russian Front - North: Day 18 of 102 of the Battle of the Demyansk Pocket, another failed attempt to break the siege at Leningrad. Russian Front - North: Day 34 of 103 of the Battle of the Kholm Pocket. Another attempt to break the siege at Leningrad. Russian Front - Center: Day 49 of 103 of the Battle of Vyazma, Russia. Russian Front - Center: Day 49 of 103 of the Battle of Sychevsk, Russia. Russian Front - South: Day 119 of 248 of the Siege of Sevastopol, Crimean Peninsula. All German attacks against Sevastopol are stopped for the winter. CBI - Burma: Day 74 of 164 of Japan's Invasion of Burma. CBI - China: Day 1,695 of 2,987 of the 2nd Sino-Japanese War. Day 64 of 99 of the 3rd Battle of Changsha. PTO - Borneo: Day 72 of 107 of the Battle of Borneo. PTO - Dutch East Indies: After the withdrawal of ABDA HQ (Australian-British-Dutch-American) from Java, General Wavell himself now leaves for Australia. PTO - Malaya: Day 7 of 357 of the Battle of Timor Island, a long guerrilla war ending in Japanese victory. PTO - Philippines: Day 80 of 152 of the 1st Battle of the Philippines. 5th Air Force provides air support. Russian Front - North: Day 536 of 872 of the Siege of Leningrad. Russian Front - North: Day 16 of 51 of the USSR's Operation POLAR STAR, a failed offensive north of Leningrad, hoping to take the southern shore of Lake Ladoga, Russia. Russian Front - North: Day 297 of 658 of the Siege of the Kholm Pocket, USSR lays siege to the Kholm Pocket but the Germans hold out for a about a year and a half. Russian Front - South: Day 7 of 25 of the 3rd Battle of Kharkov, Ukraine. The Soviets have taken Kharkov but will lose it again. MTO - Tunisia: Day 101 of 178 of the Battle of Tunisia. MTO - Tunisia: Day 7 of 7 of the Battle of Kasserine Pass. Germans retreat as British 1st Army and US 2nd Corps occupy the Pass. RAF and US Air Forces provide Allied air support. CBI - Burma: Day 67 of 104 of the 1st Battle of Arakan. US 10th Air Force provides air support. CBI - Burma: Day 18 of 79 of the Allied Operation LONGCLOTH. CBI - China: Day 2,060 of 2,987 of the 2nd Sino-Japanese War. PTO - Alaska: Day 264 of 435 of the Battle of Kiska, Aleutian Islands. US 11th Air Force attacks the Main Camp and North Head areas of Kiska Island. Atlantic: An Allied convoy of 43 ships and 19 escorts sailing to the Kola Peninsula is attacked by U-boats off Norway. The destroyer HMS MAHRATTA is sunk. ETO - Germany: Day 6 of 6 of Operation ARGUMENT, aka BIG WEEK, the US Strategic Air Forces' push to lure the Luftwaffe as heavy bombers attack key targets. B-17s attack the aircraft plant at Regensburg. Luftwaffe fighter opposition is heavy. 31 bombers and 3 fighters are lost. ETO - France: US 9th Air Force B-26s bomb Venlo, Saint-Trond and Cambrai/Epinoy Airfields. Russian Front - North: Day 43 of 48 of the Battle toward the Narva River, Estonia. This drive helped lift the Leningrad siege and goes on to liberate Narva. Russian Front - North: Day 24 of 191 of the Battle of the Narva Isthmus, Estonia. Russian Front - South: Day 64 of 113 of the USSR's Dnieper-Carpathian Offensive in southwestern Ukraine. Russian Front - South: Day 27 of 31 of the Battle of Nikopol, Ukraine. MTO - Italy: Day 40 of 123 of the Battle of Monte Cassino. RAF and US Air Forces provides air support for the Allied ground troops. MTO - Italy: Day 35 of 136 of the Battle of Anzio. RAF and US Air Forces provides air support for the Allied ground troops. CBI - Burma: Day 58 of 99 of the 2nd Battle of Arakan. CBI - China: Day 2,425 of 2,987 of the 2nd Sino-Japanese War. PTO - New Guinea: Day 160 of 219 of the Battle of Shaggy Ridge. 5th Air Force provides air support. PTO - New Guinea: Day 157 of 162 of the Battle of the Huon Peninsula. 5th Air Force provides air support. PTO - New Guinea: Day 73 of 597 of the Battle of New Britain. US 13th Air Force provides air support. PTO - Solomon Islands: Day 117 of 295 of the Battle of the Bougainville Islands. US 13th Air Force provides air support. ETO - France: Day 209 of 284 of the Battle of Brittany. ETO - France: Day 164 of 236 of the Siege of Dunkirk. ETO: Day 37 of 66 of the Battle to the Rhine. US 9th Air Force provides air support. ETO - Germany: Day 6 of 36 consecutive RAF night raids on Berlin. ETO - Germany: US 8th Air Force B-17s and B-24s bomb targets deep inside Germany. Russian Front - Finland: Day 164 of 223 of the Lapland War. Finland and Russia have joined forces to kick the Germans out of Finland's most northern province. Russian Front - Center: Day 134 of 206 of the Battle of the Courland Pocket in Latvia. Russian Front - Center: Day 32 of 75 of the Battle of Königsberg, East Prussia (now Kaliningrad, Russia). Russian Front - Center: Day 31 of 63 of the Battle of the Heiligenbeil Pocket in East Prussia. Russian Front - Center: Day 16 of 54 of the Battle of East Pomerania, Germany. Russian Front - Center: Day 13 of 83 of the German Siege of Breslau (today Wroclaw, Poland). Russian Front - Center: Day 25 of 31 of the Battle of Schwedt, Germany. MTO - Austria: US 15th Air Force B-17s and B-24s bomb at Amstetten, Linz, Villach and Salzburg. MTO - Turkey: Turkey declares war against Germany. CBI - Burma: Day 38 of 61 of the Battles of Meiktila and Mandalay. The US 10th Air Force provides air support. CBI - Burma: Day 36 of 39 of the Battle of Ramree Island. The US 10th Air Force provides air support. US troops have won the island but will need a few more days to mop up. CBI - Burma: Day 22 of 99 of the Battle of Pakokku and Irrawaddy River operations in central Burma. The US 10th Air Force provides air support. CBI - China: Day 2,791 of 2,987 of the 2nd Sino-Japanese War. US 14th Air Force attacks shipping in the South China Sea and Gulf of Tonkin, sinking 2 more vessels. PTO: Day 7 of 36 of the Battle of Iwo Jima. US 7th Air Force provides air support. PTO - Japan: US 20th Air Force B-29s bomb the urban area of Tokyo. This is their largest mission to date and its first 3-wing strike against Japan. PTO - New Guinea: Day 426 of 597 of the Battle of New Britain. PTO - New Guinea: Day 310 of 481 of the Battle of Western New Guinea. PTO - Philippines: Day 129 of 299 of the 2nd Battle of the Philippines, aka the Liberation of the Philippines or the Philippines Campaign. PTO - Philippines: Day 73 of 244 of the Battle of Luzon. 5th Air Force provides air support. PTO - Philippines: Day 23 of 29 of the Battle of Manila. 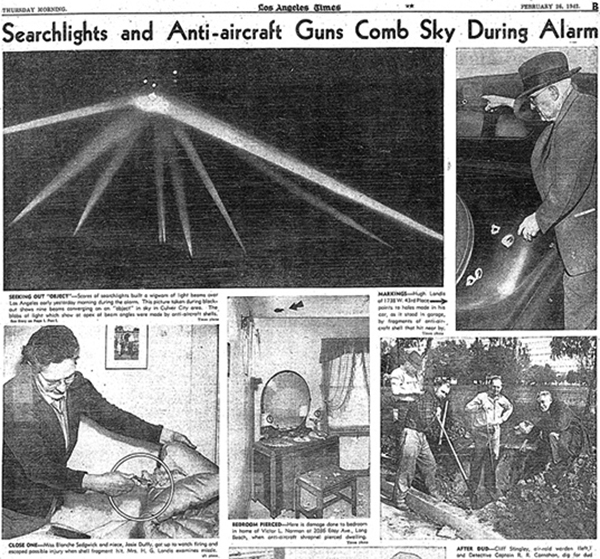 What happened that morning in the skies over Los Angeles is still an unexplained mystery that remains open to speculation and accusations of a cover-up. Two rare autobiographical works in one volume by Benito Mussolini, founder of Fascism and dictator over Italy for twenty-one years.